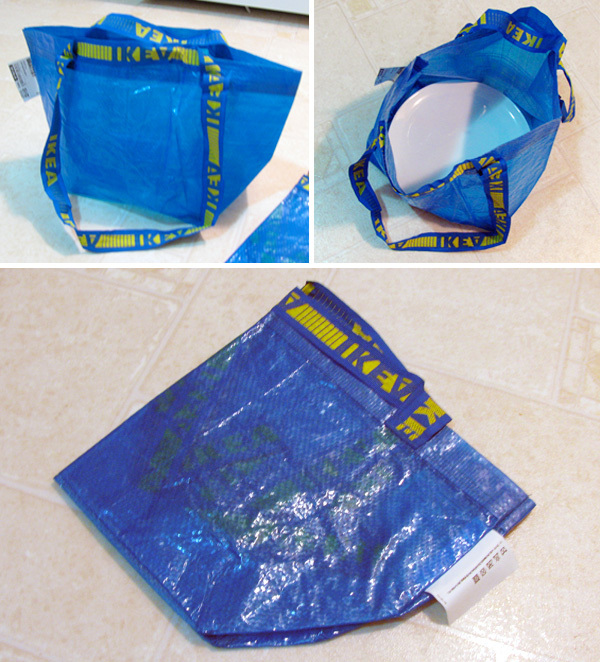 On silly discoveries i was probably far too excited about today ~ IKEA now has minis of those giant blue bags! 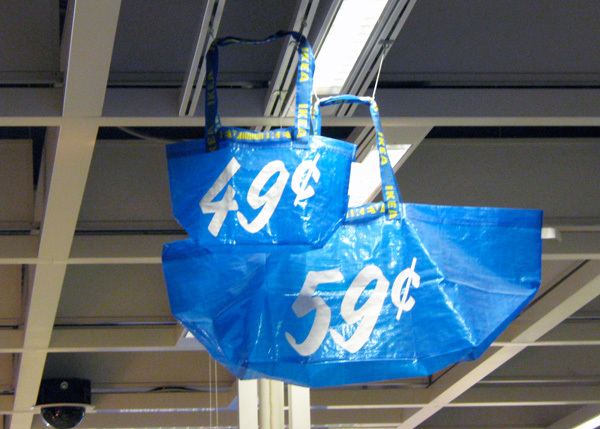 The big blue ones are still 59 cents, and perfect for everything from laundry, gardening, costco, moving and more… and these new mini totes also have the double straps (long shoulder length and short handles). These little ones are only 49 cents ~ and although they weren’t actually out with the other big blue ones, asking the check out woman, she had some in her station in a drawer! Unfortunately i didn’t have my big camera with me, but here are a few quick snapshots from the IKEA Emeryville store today, and a few more to give you some context about the size (its base is pretty much about the size of a dinner plate) ~ see the rest of the pics on the next page! ah~ sorry I didn’t notice your question..! Yep. Maybe they’re new in California. I’m from Germany. And mother country of IKEA is Europe too. Therefore we got it sooner I guess. Will it be the new “I am not a plastic bag”? not all ikea’s carry the minis. it’s what they call a ‘free range’ item. it’s up to each store whether or not to stock them. i first discovered them over a year ago in massachusettes, then found them being carried in new jersey within the last 6 months. Psh ~ Kirk ~ there’s no excuse anything should be ugly! It’s all about the balance of form AND function ~ not one over the other. 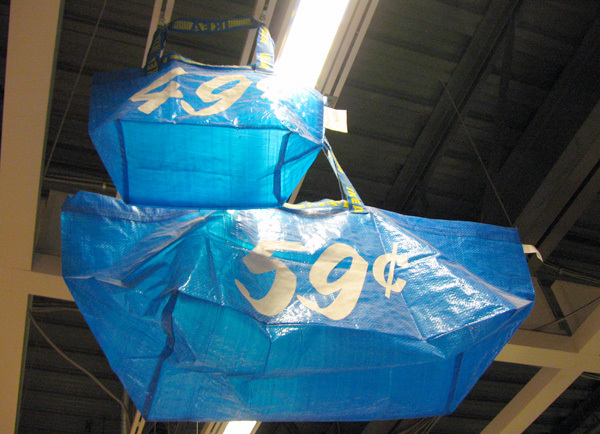 Well if your talking cuteness, the IKEA bags are cuter, plainer probably able to bring them more places. I dont get embarrased by having maybe an uglyer bag thats more functional and more comfortable. I live in socal so they are probably the same…they arent the best looking, but the amount of crap you can get into them overides any ugly factors. I do have about five Ikea bags (forgetting to bring the ones you have when going to Ikea leaves you with way more then needed. Im assuming the whole point of reusable bags is that you only have a couple, but it seems I have way more then I should. The Trader Joes bag, 2 Whole Foods bags, 3 costco bags, a Bevmo bag, 3 Target bags…..where is the recycling place for reusable bags? those minis aren’t new. i bought my IKEA-mini two years ago. The costco reusable bags are better. I take them to Ikea because they are bigger, heavier, and have two different strap lengths. 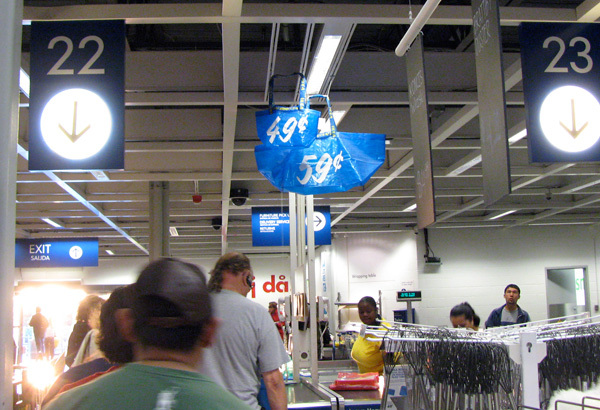 The Ikea ones are cheaper…but the costco ones are way better, plus costco also has two different kinds. A regular one, and a cold/hot bag that keeps the temperature of the item inside for a long time. I am sure you probably have them, I’m just surprised you havent mentioned how great the costco ones are.